The Battle of Fredericktown was an engagement of the American Civil War. It took place on October 21, 1861, in Madison County, Missouri. Union victory consolidated their control of southeastern Missouri. Thompson spent the early morning hours trying to determine the enemy's numbers and disposition. Unable to do so, he placed his troops and artillery in ambush along the road and awaited the Union forces. The bulk of the Missouri State Guard force was hidden from view on wooded high ground that formed a U overlooking the road. Forward of the main body, Col. Aden Lowe's infantry regiment waited in a cornfield as bait. Close behind was a supporting 12-pounder cannon as well as three 6-pounders farther to the rear and flank. About noon Plummer arrived with his column and a detachment of Col. William P. Carlin's troops. Capt. 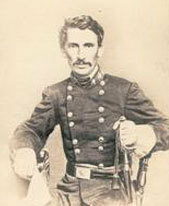 Stewart's Illinois cavalry company made the original contact. Col. Ross's 17th Illinois infantry engaged Lowe's troops first with skirmishers, then the main line of the regiment. A section of Union artillery was brought into service against the Missourians' 12-pounder, which responded. The 20th Illinois and 11th Missouri (Union) applied pressure to both flanks of Lowes's force as more Union artillery joined the battle. Lowe, having waited too long to disengage, was killed by a shot to the head, and his regiment retreated taking heavy casualties. The 1st Indiana Cavalry attempted to pursue and to capture the exposed 12-pounder, but were stopped with heavy casualties by the fire of Thompson's forces on both ridges. They called for infantry support and the 17th Illinois surged forward to claim the now abandoned piece. 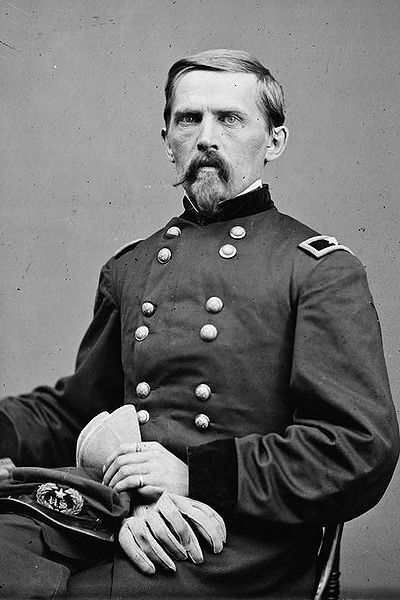 As more Union infantry poured onto the field, Thompson began an orderly withdrawal of the guardsmen. In this he mostly succeeded, except for some routing cavalry.